New for 2018 — trophies awarded to regular-season champions in NASCAR’s three national series. Kyle Busch has already claimed the regular-season trophy in the Monster Energy Cup Series, with that series concluding its 26-race regular season Sept. 10 at Indianapolis Motor Speedway in the Big Machine Vodka 400 at The Brickyard. Johnny Sauter took regular-season top honors in the Camping World Truck Series two races ago at Bristol (Tenn.) Motor Speedway. The trophies being awarded to the regular season champion were manufactured of steel and aluminum by Jostens. 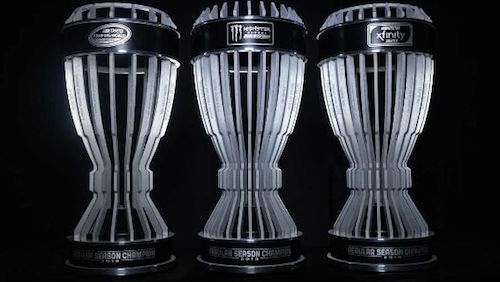 Each trophy, standing two feet tall and weighing about 35 pounds, features spires representing each regular-season race with track names engraved on them. The Xfinity Series trophy is yet to be awarded, as that series doesn’t wrap up its regular season until Saturday with the running of the DC Solar 300 at Las Vegas Motor Speedway. That trophy is likely to go to Justin Allgaier.